Stunning finishes, top quality materials, superb attention to detail and exceptional value. A couple of easily sorted hardware quibbles aside, Odery's Eyedentity is an exciting alternative to the norm. Value for money. Build quality. Well balanced toms. Snare sound. Complex snare strainer. Slightly thin chrome plating on some hoops. Odery avoids generic parts - just about everything is designed from scratch. Birch is known as the focussed wood and the toms are certainly well-balanced. In a world of drums which have more similarities than differences it is a breath of fresh air to encounter Odery. Based in Brazil, Odery offers something different and does it with a swagger. We reviewed the entry-level Fluence series last year and now we have the new and more luxurious Eyedentity. Rim shots are correspondingly vivid and dancey while cross-sticks are nicely perky too, ideal for your Brazilian sambas and bossas. 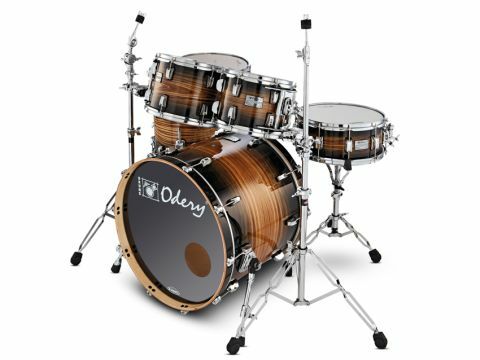 At present this is Odery's mid-range series, positioned below Privilege and Custom drums. The most obvious wow-factor is the glorious Tigerwood exotic veneer. The shells are actually Scandinavian birch with a single outer ply of Tigerwood. This is just one of several Eyedentity shell lay-ups, all using top quality lumber. Tigerwood/birch is the most spectacular, a real attention grabber with its stained and glossily-lacquered Transparent Black Burst finish. But you may prefer 100 percent bubinga with Bubinga Explosion finish, or 100 percent North American maple with a choice of three finishes: Imbuia Fade, Soft Cobre Burst, or Soft Gold Burst. The review set's birch shells are carefully finished on the inside too, with a slight nap and light seal. Bearing edges rise to a sharp 45° with virtually no round-over on the outer edge. Dimensions-wise, our kit is the fusion style Eye.402 which consists of 10x8-inch and 12x9-inch mounted toms, 14x13-inch and 16x15-inch floors, 22x18-inch bass and 14x6-inch matching wood snare. The toms are all 7-ply and 5mm thick, while the bass drum and snare are 6-ply but 7.2mm thick. Odery offers a good selection of alternative drum sizes and we should mention one other shell pack - the Eye.502 - which sports trendy shallow toms (8x61⁄2-inch, 10x7-inch, 12x71⁄2-inch, 14x11-inch and 16x13-inch) and comes with yet another different shell lay-up, this time 30 percent maple with 70 percent bubinga. Small toms are fitted with Odery's Hi Tech Suspension System brackets, which are similar to Pearl's OptiMounts. That is, they attach to both the top and bottom lugs and are thus extremely stable if rather bulky. For clamping the toms to your stands, two single New Project holders are also included. The two floor toms have their own legs while the bass drum has huge spurs - the sort of mega-struts you'd normally associate with, say, a top-spec Sonor. Unlike many other relatively new and keenly-priced companies, Odery avoids generic parts. Just about everything is designed from scratch with some impressive results. Like the elegant hump-backed bass drum 'claws' which are actually bolted to the hoops, so they always align perfectly and don't end up spread all over the floor when you change heads. The squared bridge lugs are minimum contact with thick rubber plinths and attractive brass inserts, while wing nuts have a distinctive ergonomic 'S' shape. It all looks expensive and with the way Odery is tastefully etched into the metal badges and isolation mounts, affirms Odery's mission to produce standout drums. We can only pick holes in a couple of things. First is the complex snare strainer, which we'll come to below. Second is the chrome plating on the 1.6mm triple-flanged hoops, which is for some reason a bit thin and sorry-looking. All other chrome plating on lugs and brackets etc, is excellent. Ironically the hoops are perhaps the one part Odery out-sources and no doubt this blip can be quickly sorted. Sharp 45° bearing edges with virtually no round-over mean there is the least possible contact between heads and shells. This type of edge acts like a guitar bridge and theoretically you get more of the flavour of the head and less infusion of timbre from the shell. This would seem true of the toms, which are brisk, bright and resonant. The shells are of course birch, which is known as the focused wood, and the four toms are certainly well balanced. Tuning takes just a few smooth turns of the bolts and the fitted Evans G1s are further proof Odery does not cut corners. The Eyedentity has graded shells with the bass and snare drums thicker than the toms. This extra girth gives both drums even more of a lift so that the bass drum sounded quite hard at first. An aggressive tone, edgy and slamming. This is no bad thing since the perceived pitch drops quickly over distance. You retain the attack and the clarity, but gain depth. The bass drum had a 6-inch hole cut in the front head which immediately gives it more dryness and impact. Nonetheless it is a big sound which we tempered a little with lowered tuning and a small towel against the inner batter. That way lay the benefits of power from the big shell but with a sweeter tone. Now, before dealing with the snare sound, there's the question of the fancy strainer. Unlike bass pedals we reckon strainers need as few adjustments as possible. Odery's has more settings than you can shake a stick at. The adjustment knob can be clicked into no less than four positions. Starting with 'off', you then go to 'too-loose-to-be-of-any-use', followed by 'slightly-too-loose-funky', to 'slightly-too-tight general purpose'. Multi-positions might sound like a cool idea but in practice we find they're redundant, more of a hindrance than a help. Once you've found the ideal tension then any other position is going to be a compromise and not quite right. That's just us, though - you might love it. The on-off lever is comfortable enough, a rounded knob that pulls vertically up and down. It is, though, quite stiff and can engage with a noisy clatter of snares on the bottom head. A knurled ring under the top, four-position switch actually adjusts snare tension, operating anti-clockwise to increase the tension. It is awkward to grip, being small and positioned under the four-position knob. But once you get used to it, it works. Like everything else by Odery, the whole strainer contraption is solidly made and looks dependable, but it smacks of trying too hard. Having said all that, the sound of the snare drum gets a solid thumbs-up. We reckon 6-inch is an under-used but versatile depth, resulting in a beefy tone without being sludgy. Tuned medium-high there is clarity combined with body. And played bang in the centre the beat remains bright and resonant, which is not always the case. Oftentimes snare drums will be dead in the centre, but the thick-ish birch shell and sharp edges obviously combine to make this drum lively right across the head.